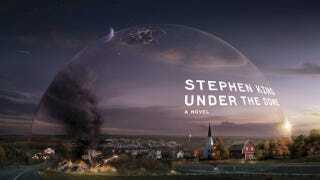 CBS is moving forward with lightning speed with its TV adaption of Stephen King's novel Under The Dome, with a fast-track order of 13 episodes to air next summer. The story is centered around a little town that is suddenly isolated by the government by a giant dome —nd now the townsfolk will have to deal with exactly what was quarantined inside with them. Executive Producer Brian K. Vaughan penned the adaptation, with Steven Spielberg's Amblin Entertainment producing. That's a lot of good names attached to one project. Fingers crossed, everybody.